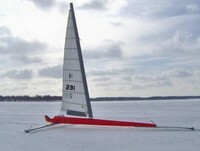 Sorry folks, but the spring sailing season, for all practical purposes, is over. Yes, we still have ice and yes, a few hardy sailors (read Drifter, JD and Kennedy) might get one or two more days, but mother nature is flexing her muscle. If you need proof the end is near, the International Skeeter Association Championship followed the lead of the Northwesterns and pulled the plug on the ISA's.